Defining cations and anions, using hydrogen as an example. An ion is a chemical particle carrying a net electric charge. 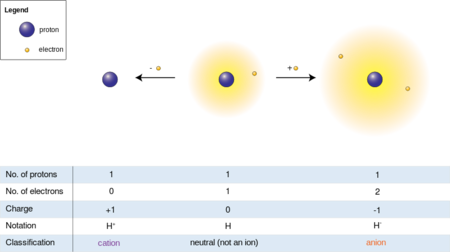 Ions have either an excess or a deficit of electrons in comparison to the total number of protons in the nuclei of their constituent atoms--which is why they have a net charge. 1. Shed electrons from its outer shell until its configuration matches that of the noble gas that ends the period immediately above its own period. Thus, sodium, having one electron in its outer shell, will shed that electron and thus have ten electrons arranged in the stable configuration of an atom of neon. A sodium atom in such a state is a sodium ion having a charge of +1. 2. Acquire electrons to fill its outer shell, so that its configuration will match that of the noble gas at the end of its own period. Thus, fluorine will acquire a single electron in order to match the electron configuration of neon. This fluorine atom is now a fluoride ion having a charge of -1. 3. Form a covalent bond with another atom, in which each atom contributes one, two, or even three electrons that each spend part of their time associated with each atom in order to complete both atoms' electron shells. This does not, however, apply to metals in their usual "metallic" form. What we think of as a metal, is a metallic element in metallic crystal form, which has atoms of that metal "swimming" in a "sea" of electrons. All ions have charge, and any charge may be positive or negative. The amount and direction of the charge is the ion's valence. An ion having a positive valence is called a cation (from the Greek kata down), and an ion having a negative valence is called an anion (Greek ana up). In addition to valence, one describes ions by the number of atoms they contain, according to some highly specific naming conventions. Simple ions, or monatomic ions (from the Greek monos alone), exist as single atoms that have adjusted their number of electrons to a stable configuration by shedding or acquiring electrons.The symbol of a simple cation is the symbol of its base chemical element with one or more superscript "+" signs applied to it to indicate its charge. Simple cations are formally called by their element names with a suffixed Roman numeral in parentheses to indicate its charge--thus, sodium (I) or iron (II) or iron (III). Usually a +1-charged simple cation is called only by its element name, particularly in the case of cations formed from Group IA elements. Cations can also have informal names, formed by adding the suffix -ic to its name (usually its name from antiquity) for a cation having the most common charge, or -ous if the cation has less than the usual charge--thus, ferrous for iron (II) or ferric for iron (III), because iron (III) is a more common ion than is iron (II). A simple anion has a name that is the original elemental name with the final syllable changed to -ide. Thus the anion of fluorine is called fluoride, that of chlorine, chloride, and so on. Its symbol is the chemical symbol of its base element with a superscript hyphen or "-" sign with a multiplier prefixed to it (if the charge is greater than -1), or sometimes a superscripted stack of hyphens. The chief determinant of the valence is the group that the ion's base element is in. Group IA atoms form +1 cations, and group IIA atoms form +2 cations. Similarly, Group VIIA atoms form -1 anions, and Group VIA atoms form -2 anions. However, B-group atoms, especially those of metals, can form ions of a variety of valences, usually positive. Noble gas atoms never form ions, except under the most extreme laboratory-produced conditions. When two or more atoms join together with covalent bonds, and still have a net charge on the entire particle to redress an imbalance in their electron configurations, the result is a polyatomic ion. Most polyatomic ions are anions, but polyatomic cations do exist. The most common of the latter is ammonium, which forms when a molecule of ammonia captures a stray proton from an outside source, typically a molecule of water in which it might be dissolved. Polyatomic ions have a strict naming convention of their own. Common polyatomic cations have names ending in -ium. The two most common polyatomic cations are ammonium (NH3+) and hydronium (H3O+). That last requires more explanation, which will be given below. -ate indicates the most common form of the anion--thus, SO42- is called sulfate. -ite indicates an anion having one fewer than the usual number of atoms of oxygen--thus, SO32- is called sulfite. An anion having two fewer atoms of oxygen would be named by adding the prefix hypo- to the -ite name. An anion having one more atom of oxygen than the -ate form would be named by adding the prefix per- to the name. Thus ClO- is called hypochlorite and ClO4- is called perchlorate. These suffixes connote nothing about the amount of charge on the anion. In the case of inorganic polyatomic ions, the sole determinant of the charge is the position of the distinguishing atom in the periodic table. A polyatomic ion will have a valence comparable to the valence that the simple ion of the distinguishing atom would usually have. Organic polyatomic ions are almost always the dissociated forms of weak organic acids. All such ions end in the suffix -ate--thus, acetate, propionate, butyrate, etc. Regardless of type, polyatomic ions are symbolized in a manner similar to that of molecules: one writes the symbols of the constituent elements, with subscripts to describe their ratio, and superscript valence signs as described above for simple ions. The hydronium ion is a special case that occurs almost solely in aqueous solutions. Contrary to popular perception, free atoms of hydrogen never form stray ions in solution. A hydrogen ion is the same as a free proton, deuterium, or tritium. But in fact a hydrogen ion dissolved in water will always form a covalent bond with one of the two electron pairs on the oxygen atom of the nearest molecule of water. The result is a particle having a valence of +1 and consisting of three parts hydrogen to one part oxygen. Such a particle is a hydronium ion. A hydroxide ion forms when a water molecule loses one of its two atoms of hydrogen (almost always to another molecule of water to form a hydronium ion) and retains two extra electrons to round out the electron configuration of the oxygen atom. It has one part hydrogen, one part oxygen, and a valence of -1. Ionic compounds are named by combining the cation name with the anion name--thus iron oxide (FeO) or sodium carbonate (Na2CO3). If the anion had the suffix -ate, then one changes the -ate suffix to -ic and adds the word acid. Thus, H2SO4 is called sulfuric acid. If the anion had the suffix -ite, then one changes the -ite suffix to -ous and adds the word acid. For halide anions, the name is formed by adding the prefix hydro- to the anion name, changing the -ide suffix to -ic, and adding the word acid. Thus, HCl is called hydrochloric acid. This does not apply to Group VIA or VA compounds--and in fact, "hydrogen oxide," or water, is not an acid at all. When an ionic compound having hydroxide as the sole anion is precipitated out of solution, the cations involved bind to the hydroxide ions and form strong bases. The most common examples are the hydroxides of sodium and potassium (commonly called caustic soda and caustic potash). Sometimes, three or more simple ions and/or polyatomic ions will form a compound. This usually happens when a polyvalent (having a valence with an absolute value greater than one) anion forms a compound with more than one cation of lesser valence. The formal name for such a compound begins with the names of the cations and ends with the name(s) of the anion(s). But some informal naming conventions apply. The most common example of this involves hydrogen participating as one of two or more monovalent (having a valence whose absolute value is equal to one) cations combining with a polyvalent anion. In such a case, the hydrogen ion will unite covalently with the anion, leaving the other cation to form part of a regular binary lattice. The anion thus formed will now have a lesser valence, and usually will have a different name as a result. The most common alteration is to add one atom of hydrogen to the anion--in which case the prefix bi- is added to the anion name. Examples include sodium bicarbonate (NaHCO3, "bicarbonate of soda") and sodium bisulfate (NaHSO4). This page was last modified on 20 October 2017, at 12:17.